The political course of the Republican Party has not been greatly influenced by Mr. Rowland. As a talk show host and political commentator, Mr. Rowland’s influence on the Republican Party as such is on a par with the influence exerted by any newspaper editorial or Op-Ed commentary, and the connection drawn by Ms. DiNardo between the Prescott Bush Dinner and Mr. Rowland’s indictment is highly attenuated. According to Ms. DiNardo, the GOP should not have invited as its principal speaker the grandson of the man after whom the Prescott Bush Dinner is named because years ago, before Mr. Rowland was first indicted for political corruption, Governor Rowland, then in good odor among Republicans, and the Bush family were on cordial terms. Perhaps people who are easily persuaded by political propaganda will credit Ms. DiNardo’s attenuated connection, but a media alert to campaign propaganda will notice the more obvious gaps that disconnect Mr. Rowland from Republican Party affairs. As a radio talk show host, a position Mr. Rowland has now abandoned, Mr. Rowland was little more than a drop in an ocean of commentary, most of it favorable to Connecticut’s Democratic one-party state apparatus. He was informative and sharp in his criticism, a nettlesome burr under the saddle of Malloyalists who wince at any criticism and whose first response is not to meet it bravely but to marginalize it. Connecticut’s non-partisan media should make note of such obvious gaps when reporting the political fantasies of the state’s chief Democratic political propagandist. 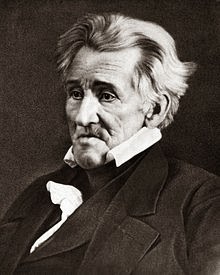 Andrew Jackson, after whom the “Jefferson, Jackson, Baily” dinner is named, gained political prominence following his defeat of the Creek Indians at the Battle of Horseshoe Bend in 1814 and, as president, Mr. Jackson initiated the Indian Removal Act of 1830, forcing the relocation and resettlement of Native American tribes from the Southeast to west of the Mississippi River. Yet, incredibly, the state GOP party chairman, Jerry Labriola, thus far has not tarred Ms. DiNardo’s party with the past sins of Andrew Jackson or Thomas Jefferson, who was a slaver. Any attempt to do so would rightly be denounced as political propaganda by Connecticut’s alert non-partisan media. As a general proposition, the sons are not guilty of the sins of their fathers. None of the persons named in the recent indictment used by Ms. DiNardo to tar both the Connecticut GOP and Jeb Bush, the former Governor of Florida who has been mentioned as a possible GOP presidential prospect, have been actively engaged in Connecticut politics. Mr. Rowland was – please note the past tense – a radio talk show host, and Ms. Lisa Wilson Foley, who had never held office, was a prospective Republican Party candidate for the U.S. House seat now held by Representative Elizabeth Esty. The legal guilt or innocence of all the parties mentioned in the indictment is a matter to be determined by a court. Legal decisions, particularly in trials involving politicians, tend to swing on esoteric laws unfamiliar to people who make rational moral decisions based upon common sense. The moral culpability of the parties mentioned in the indictment is a matter that should be addressed in appropriate public forums – provided everyone can agree on the chief point: that moral responsibility should rest exclusively with the person or persons who have committed the putatively immoral act and not their past political associates. One of the things that distinguishes the RINO is his willingness to throw conservatives' or even other RINOs like Rowland, under the bus, to buy into the legitimacy of the attacks from the left, and to show that he is contrite. What was done to Scooter Libby is a disgrace not only to the Dems, to the politicized CIA, to Fitz the dishonest prosecutor, but to President W. Bush, who, if nothing else, should have pardoned Libby upon exiting in 2009. In this case, Rowland was operating on his own, not on behalf of the Party; although it's pretty clear he's not much of an operator. I honestly don't know, and don't intend to research, what he did wrong, or why he had to conspire to get paid under the table. Suffice to say that if I were asked for advice on how to be a weasel, I'd recommend that my client observe and emulate the machinations of the Klintons. He has to appreciate the advantages of bagmen, and other obfuscatory devices. Don't go asking for money under the table, but suggest that friend pledge future contributions to the John Rowland Library.